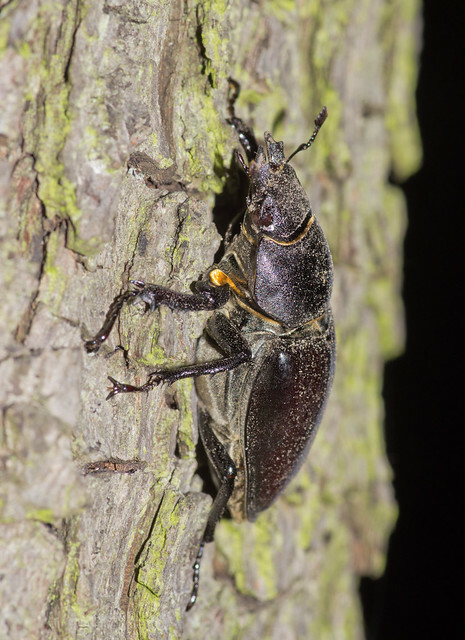 They are Britains biggest insect (well on land, the aquatic great silver water beetle may be heavier) and spend at least 3 years as larvae eating rotten wood before pupating and emerging as the rather sizable exotic looking adult. …or use the flash. This is tricky however as they are very reflective and my efforts in previous years using on camera flash resulted in shots with little colour. However using off camera diffused flash worked pretty well. 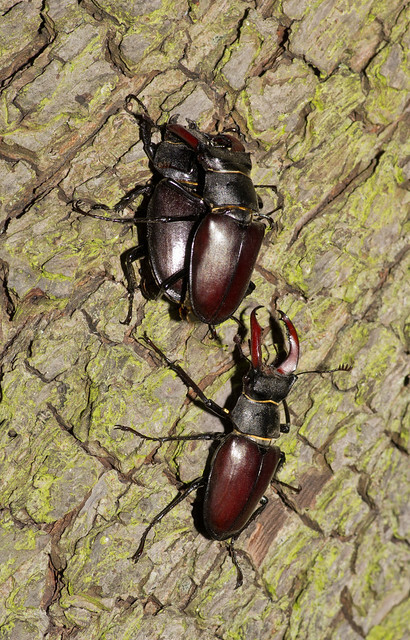 The beetles tend to gather on an old pear tree, which I believe the beetles may be emerging from. Here is a female, which lacks the ‘antlers’ of the male. This male had just landed on the tree, you can see its wing still sticking out from under the wing case. Of course when a male and female are on the same tree, the male seems to know where she is. He does this by following her pheromones. 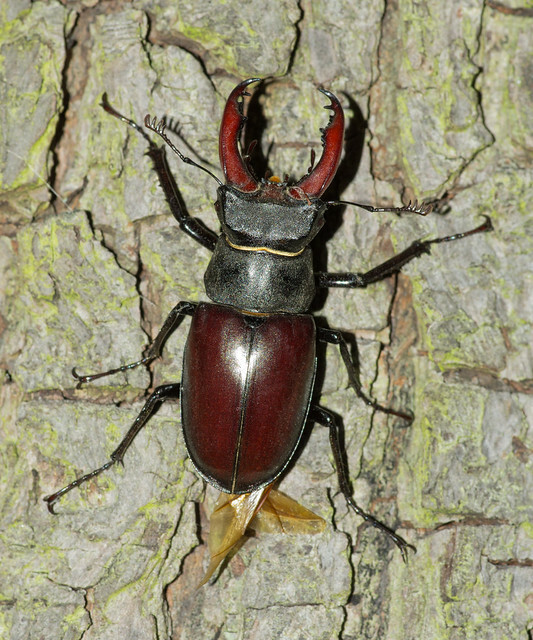 Stag beetles of both sexes produce these using a yellow patch of setae on the femur of their front pair of legs (more about this here). You can see this yellow patch on the male in the pic below (and on the pic of the female above). Of course when the male finds the female the inevitable happens. There is no courtship, he just crawls on top of her! 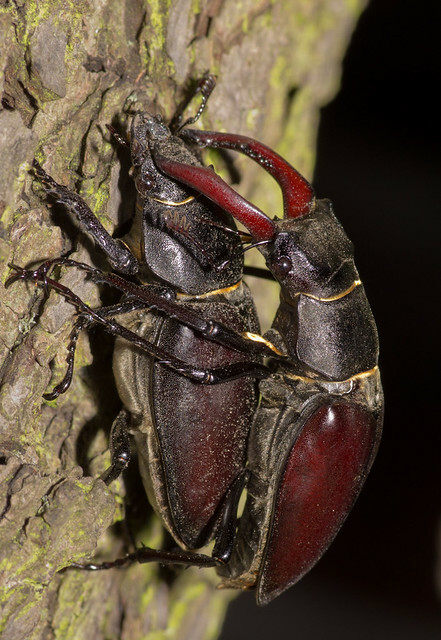 The pheromones continue to attract others though, which can lead to fights sometimes when a second male arrives. This one however just wandered nearby and didn’t interfere. Not bad for my garden. What a great set and how lucky you are to have them in your garden. 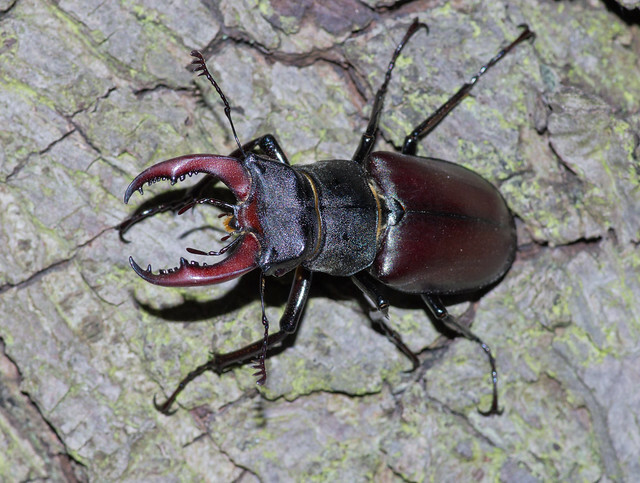 I have Stag beetle envy! 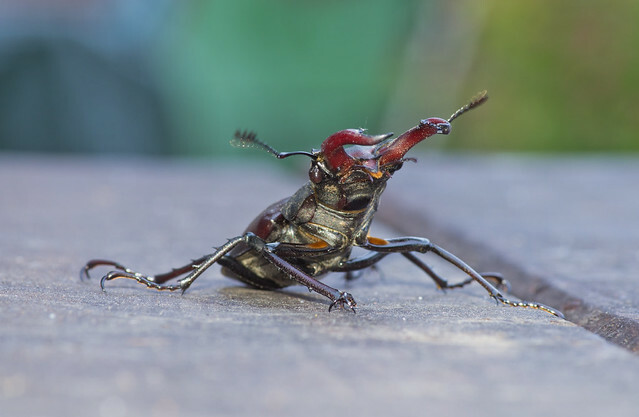 very interesting and great photography – would you allow me to use one of the pictures in my Bsc ecology assignment on stag beetle conservation?. Would be very grateful and obviously will reference to your article. I look forward to your reply. 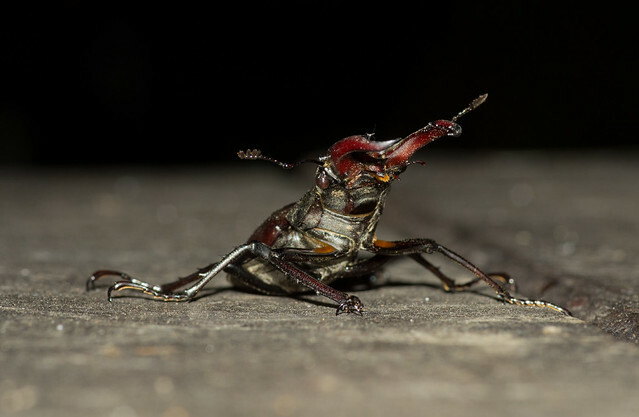 I have a huge irrational fear of beetles, so when i found one of these crawling across my living room floor i completely soiled myself :-/ i plucked up the courage to get some card and a large glass to catch it and release it in the garden…. Far away from the house lol my concern now is, what are the chances of there being more in my house? I shall be losing sleep until i know 🙁 please help.